How much does a backyard landscape cost in Arizona ? One of the most asked questions we get here at Arizona Living Landscape & Design is: How much does a backyard landscape cost in Arizona ? This is a difficult question to answer but we will try to explain some of the general guidelines we go by. The purchase and design of a backyard landscape or front yard landscape is much like the purchase of a new home. There are so many options that the final landscape cost can vary dramatically. Consider a new home build has a base price of $100K. When you start adding options such as lot size and location, optional rooms, upgraded counters, flooring, appliances, water softeners and filtration, roof tiles, front elevations, fireplace, surround sound, etc., the price can quickly jump another $50K or even $80K. The average person moves every 5-8 years but they still want all of the upgrades to make it a home they can enjoy. The same goes with a backyard or front yard landscape cost in Arizona or anywhere. You spend much of your time in your yard and you want it to feel like home. You want to enjoy the space you live in and want your backyard to be an extension of your home. Picking the right landscape design and options the first time is crucial for maximum enjoyment, low maintenance, and flexibility. Unfortunately, some people focus on the price and look for the “cheapest” contractor, therefore sacrificing quality, aesthetics, and long-term enjoyment. You cannot trade in a landscape if you do not like it or if it does not meet your long-term goals without a high cost. The right landscape contractor will be able to guide you and help you with answers to your questions and tell you if something will not work and why. 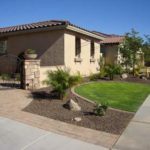 Arizona Living Landscape and Pete have many years of experience working with homeowners to help them make the right decision. 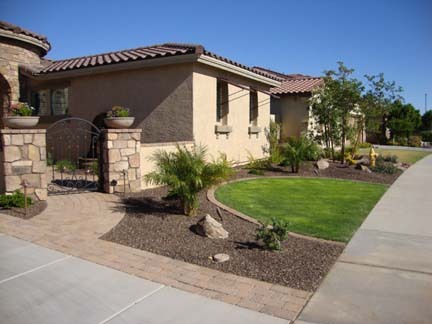 We have many repeat customers and referrals because of the quality of our work and our knowledge of the industry and Arizona specific landscape design. Many landscape contractors will also be able to help you find a trusted paver service and installation service too. Decorative patio extension: concrete pavers, travertine pavers, flagstone, concrete, colored concrete, stamped concrete, etc. Hardscape features: built-in BBQ, Fire Pit, Pony Wall, Gazebo, Seating area or Seat Wall, Planters, cultured stone versus stucco finish, travertine counters on your BBQ area versus flagstone or tile or concrete, etc. Automatic irrigation water system: drip system for plants, optional second line for trees, sprinklers for grass area. Tree and plant material: desert adapted plants for low maintenance or tropical plants which require more maintenance and water. Low voltage landscape accent lighting. Retaining Walls – block with stucco or cultured stone finish, stack block options such as Pavestone or Belgard wall systems. Block walls – regular fence block, larger 8x8x16 block, Pavestone or Belgard wall systems, rough finish face versus flat block, stucco finish. Pool decking: concrete pavers, travertine pavers, kool deck, tile, stone, etc. Border around grass area: curbing, pavers, etc. Automatic irrigation timer: 4 station, 6 station, etc. There are so many options available, and when someone receives a quote from our company, we thoroughly examine each option as to educate the homeowner on the option’s benefits and to identify its overall importance to the success and longevity of the project. We also design a yard that you can grow with so you can add or change things to meet all of your wants and dreams as your are financially able to while still giving you the yard you want within your budget. We offer nine different landscape packages for our customers to start with and unlike most landscape contractors we will do as much or as little as our customers want us to do. We can add or remove options to meet your needs and still fit within your budget in most cases or design a completely custom yard with all of your wants. Give us a call on your next Arizona landscape project or fill out our contact form for a free quote and design.